All Seasons Termite & Pest Control - honey Bees BEE SAFE!Protect yourself, your family, home and property from honey bees. WHAT TO DO IF YOU FIND BEES ON YOUR PROPERTYSTAY AWAY FROM ALL HONEY BEE SWARMS AND COLONIES.GET AWAY FROM BEES AS QUICKLY AS POSSIBLE.WHILE RUNNING AWAY PROTECT YOUR FACE AND EYES AS MUCH AS POSSIBLE.TAKE SHELTER IN AN ENCLOSED AREA SUCH AS A CAR, TRUCK OR BUILDING.DO NOT HIDE IN WATER OR THICK BRUSH.DO NOT STAND STILL AND SWAT AT BEES; RAPID MOVEMENTS WILL CAUSE THEM TO STING. 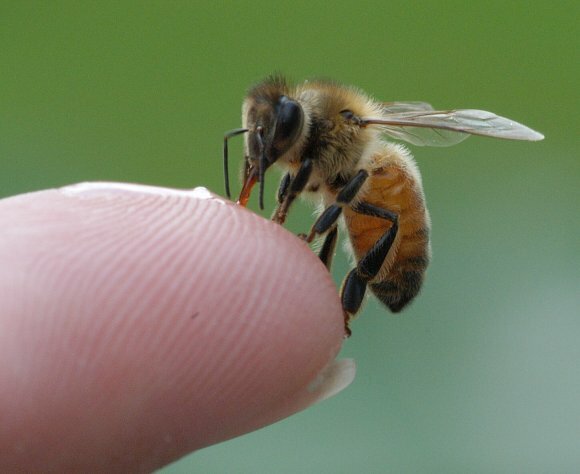 WHAT TO DO IF STUNG GET AWAY FROM BEES AS QUICKLY AS POSSIBLE. GO TO A SAFE AREA AWAY FROM THE BEES SUCH AS INSIDE A CAR, TRUCK OR BUILDING.PULL OR SCRAPE STINGS FROM SKIN AS SOON AS POSSIBLE. MOST VENOM IS RELEASED WITHIN 1 MINUTE.WASH STUNG AREAS WITH SOAP AND WATER LIKE ANY OTHER WOUND TO PREVENT INFECTION.APPLY ICE TO RELIEVE PAIN AND SWELLING. SEEK MEDICAL ATTENTION IF BREATHING IS DIFFICULT, IF STUNG MANY TIMES, OR IF ALLERGIC TO BEE STINGS. Protect yourself, your family, home and property from honey bees. STAY AWAY FROM ALL HONEY BEE SWARMS AND COLONIES. GET AWAY FROM BEES AS QUICKLY AS POSSIBLE. WHILE RUNNING AWAY PROTECT YOUR FACE AND EYES AS MUCH AS POSSIBLE. TAKE SHELTER IN AN ENCLOSED AREA SUCH AS A CAR, TRUCK OR BUILDING. DO NOT HIDE IN WATER OR THICK BRUSH. DO NOT STAND STILL AND SWAT AT BEES; RAPID MOVEMENTS WILL CAUSE THEM TO STING. GET AWAY FROM BEES AS QUICKLY AS POSSIBLE. GO TO A SAFE AREA AWAY FROM THE BEES SUCH AS INSIDE A CAR, TRUCK OR BUILDING. PULL OR SCRAPE STINGS FROM SKIN AS SOON AS POSSIBLE. MOST VENOM IS RELEASED WITHIN 1 MINUTE. WASH STUNG AREAS WITH SOAP AND WATER LIKE ANY OTHER WOUND TO PREVENT INFECTION. APPLY ICE TO RELIEVE PAIN AND SWELLING. SEEK MEDICAL ATTENTION IF BREATHING IS DIFFICULT, IF STUNG MANY TIMES, OR IF ALLERGIC TO BEE STINGS. Honey bees live in social units called colonies. A honey bee colony consists of a single queen, who is usually the mother of all other colony members, ten to thirty thousand semi-sterile female workers and, from zero to a few thousand males (drones) depending on the time of year. The immature forms are collectively referred to as brood and include eggs, larvae, and pupae. Adult workers perform all of the behavioral tasks associated with colony living. Worker honey bees perform different tasks as they age, a phenomenon called temporal polyethism. When bees emerge from their cells as adults they normally clean cells, then as they age they feed larvae (nursing behavior), process and store food, secrete wax and construct comb, and guard the entrance. The most pronounced change in behavior occurs when bees are about three weeks old when they begin foraging. At this time, they cease performing most tasks within the nest and usually remain foragers for the rest of their lives. This age progression is not rigid and many factors such as genotype, colony social structure, foraging environment, time of year, and pheromones affect developmental rates and trajectories. Colonies reproduce through a process of colony budding, commonly referred to as swarming. As colonies grow to swarming size, factors that inhibit queen rearing are released and new queens are reared in the presence of the old queen. 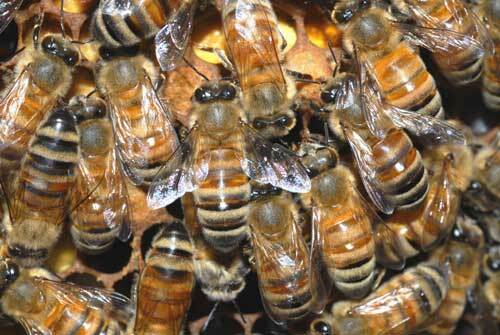 Ordinarily, but not necessarily, the old queen leaves the nest with a group of bees to initiate a new nest. A daughter queen inherits the valuable parental nest and any remaining adults. In feral, unmanaged colonies, swarming-related queen rearing begins when colony size is about 12,000 workers and colonies may swarm when there are about 20,000 workers. Adult population size at swarming is highly variable and not the singular determinant for swarming. Other factors such as time of year, adult age distribution, and foraging environment also affect the timing of swarming. In temperate climates swarming usually takes place in the spring. In tropical and sub-tropical climates swarming may take place any time of year. Worker honey bees are about five-eighths of an inch long and are brown or black with yellow-striped abdomens. Africanized honey bees are slightly smaller than the regular honey bee, but the bees look so much alike that only lab analysis can tell them apart. Wasps are slender with a thick waist. Their "skin" is generally smooth and somewhat shiny, often with sharply contrasting black and yellow patterns. Their hind legs are narrow. Yellow jackets are marked with black and yellow. They prefer to nest in the ground but can be found in wall voids and similar places. Their bodies are wider than those of the wasps. Bees will choose a nesting site in many places where people may disturb them. Nesting cavities may include: buckets, cans, empty boxes, old tires, or any container ranging in volume from as little as 2 to 10 gallons and more. Bees will also choose infrequently used vehicles, lumber piles, holes and cavities in fences, trees, and the ground, in sheds, garages, and other outbuildings between walls or in the open, low decks or spaces under buildings. REMOVE POTENTIAL NEST SITES AROUND BUILDINGS. Do not attempt to exterminate them yourself.